A brahmin named Haridas once heard a voice that said, "I will trouble your king for seven and half hours." Haridas was frightened and told his wife what he had heard. She knew that it was the voice of Saturn, so she said, "You must protect the king and take the trouble on yourself." When Haridas heard the voice again, he offered to take the trouble on yourself." Saturn agreed and said, "Your period of trouble starts now." One day, Haridas went to the river to pray. He found two watermelons, Which he took home. Meanwhile, the two princes were found to be missing. When the soldiers came looking for them, Saturn made Haridas's watermelons look like the heads of the princes. 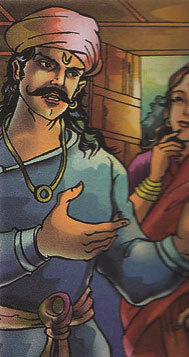 The king ordered Haridas to be hanged. But just before he could be hanged, his period of trouble was over. The princes returned safely and Haridas was saved .